Astros pitcher Justin Verlander is Sunday’s Box-Toppers Player of the Day and rises to fifth place in season player rankings. Verlander also rises into the top 10 in Box-Toppers career points list (tracked since 1995) and becomes the fourth player with 20 or more points this season, reaching that milestone for the first time in six years. Also Sunday, Red Sox pitcher Chris Sale rises to third place in Box-Toppers season player rankings after earning Player of the Game honors, becoming the fifth player with 20 or more points this season. Braves pitcher Sean Newcomb is Monday’s Box-Toppers Player of the Day, becoming the 35th player this season to reach 10 Box-Toppers points. Also Monday, Astros pitcher Justin Verlander rises to sixth place in Box-Toppers season player rankings after earning Player of the Game honors. Verlander also rises to 11th place in career points since 1995, passing the the 170.7 career point total of the late Roy Halladay. Giants pitcher Madison Bumgarner is Thursday’s Box-Toppers Player of the Day, his first Player of the Day honor in nearly two years. Also Thursday, Nationals pitcher Max Scherzer increases his lead in Box-Toppers season player rankings after earning Player of the Game honors. Nationals pitcher Max Scherzer is Tuesday’s Box-Toppers Player of the Day, regaining top spot in season player rankings and rising to 10th place in career points on Box-Toppers “all-time” points list. Also Tuesday, three others earning Player of the Game honors are among the top 10 in Box-Toppers season player rankings—Mariners pitcher James Paxton, Diamondbacks pitcher Patrick Corbin and Indians pitcher Corey Kluber. Yankees pitcher Luis Severino is Wednesday’s Box-Toppers Player of the Day and rises to retake the lead in season player rankings. Also Wednesday, Mookie Betts of the Red Sox rises to ninth place in Box-Toppers season player rankings—and is the only batter among the top 10—after earning Player of the Game honors. Yankees pitcher Luis Severino is Thursday’s opening day Box-Toppers Player of the Day. Severino struck out seven over 5 2/3 scoreless innings, allowing one hit and three walks, in the 6-1 win over the Blue Jays. Mariners pitcher Ariel Miranda is Saturday’s Box-Toppers spring training Player of the Day. Box-Toppers is tracking several days of the 2018 spring training season to demonstrate the Box-Toppers player tracking metric and to prepare for the upcoming 2,430-game season. Dodgers pitcher Clayton Kershaw leads the list of Box-Toppers Active Career All-Stars and is one of three active players to be included on Box-Toppers All-Time All-Star team. The Box-Toppers All-Time All-Star team consists of the best players by position since Box-Toppers tracking began in 1995 and includes 12 players who have retired and three who are still active—Kershaw, along with Albert Pujols of the Angels and Miguel Cabrera of the Tigers. In 2017, Carlos Beltran tied Jason Giambi for the longest streak of consecutive seasons earning Box-Toppers points at 19. With Beltran's retirement, CC Sabathia and Albert Pujols now have the longest active streaks of consecutive seasons earning Box-Toppers points at 17. An analysis of 23 years of Box-Toppers points leaders in pitching & batting in both leagues. 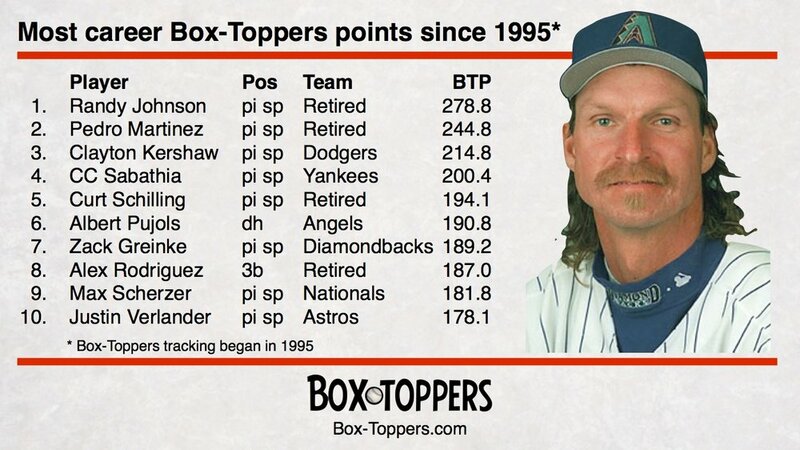 Dodgers pitcher Clayton Kershaw leads players in Box-Toppers points since the start of 2012. Kershaw has 147.2 Box-Toppers points over the period 2012-2017, 18.3 points ahead of second-place player in that span, Nationals pitcher Max Scherzer (128.9). However, Kershaw’s lead in the six-year rolling Box-Toppers point total is down from last year and is his narrowest lead since 2013.